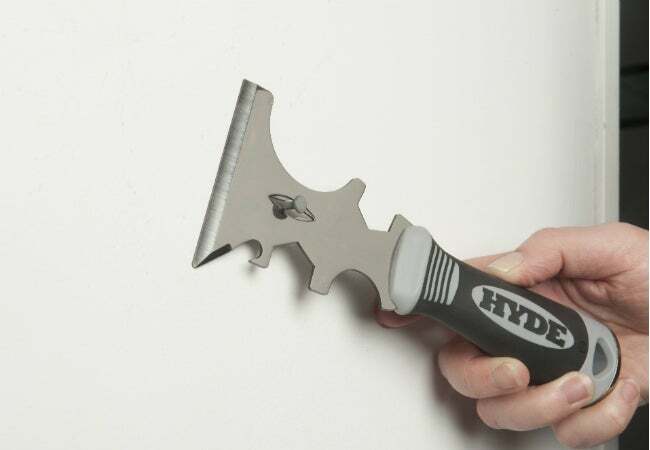 Transform your walls from snooze-worthy to stunning using this simple guide and a hardworking multi-tool from HYDE. Paint offers one of the lowest cost and least time-intensive ways to perk up a living space. However, all of the time, effort, and money typically spent preparing and applying that fresh face can make the job more of a pain than a pleasure. Whether you’re stripping old paint from the wall with a paint scraper, removing stubborn nails with a drill or nail extractor, or patching up holes with a putty knife, buying—and then mastering the use of—each of these individual tools can drain your energy and wallet long before you even apply the first stroke of paint. Fortunately, there’s an easier way. With minimal tools—a HYDE 17-in-1 Painter’s Tool, paintbrush, roller, and tray—you can complete the job in record time. The secret? Your pocket-size multi-tool performs the role of a nail remover, paint scraper, putty knife, paint can opener, hammer, roller cleaner, and 11 other individual tools, which drastically cuts down on the energy and time you spend rummaging for the right tool for the task. Read on to get the lowdown on how to downsize your toolbox and revitalize your walls with this painting essential from HYDE. STEP 1: Prepare the work zone and wall. Don’t want your prized possessions to get splashed with paint? Remove lightweight furniture and window dressings from the room before cracking open the paint can. Where possible, push heavier furnishings to the center of the room, and cover them with a tarp. Cover the rest of the exposed floor with drop cloths. While you’re clearing out the room, take down wall-mounted shelves, artwork, and any other decor that’s mounted on the walls. You’ll find that it’s a cinch to extract nails from the walls with the nail and brad remover conveniently built into the center of the rustproof steel blade on the HYDE 17-in-1 Painter’s Tool. You can use one of the four screw bits hidden inside the tool’s handle to remove light switch or outlet covers. Don’t sweat wall imperfections like old paint build-up, small holes, or shallow dents in the drywall. The beveled side of the angled blade of the 17-in-1 Painter’s Tool makes it a snap to scrape off old paint, while the smooth blade on its flip side spreads spackling compound smoothly over unsightly holes. Because the molded handle of the Painter’s Tool has a thumb stop for added safety, you can maintain a steady hand and avoid accidents while you’re prepping your painting surface. Mix mild detergent soap and water in a bucket, then wash the prepped walls using a lint-free cloth to remove dirt and debris and diminish grease stains or discoloration. Once the walls have completely dried, apply painter’s tape along the edges where the walls meet the trimwork and ceiling (as well as around any window trim). Technically, you can skip the primer if you’re on a budget, but this base coat goes a long way toward improving paint absorption and reducing the number of top coats required. 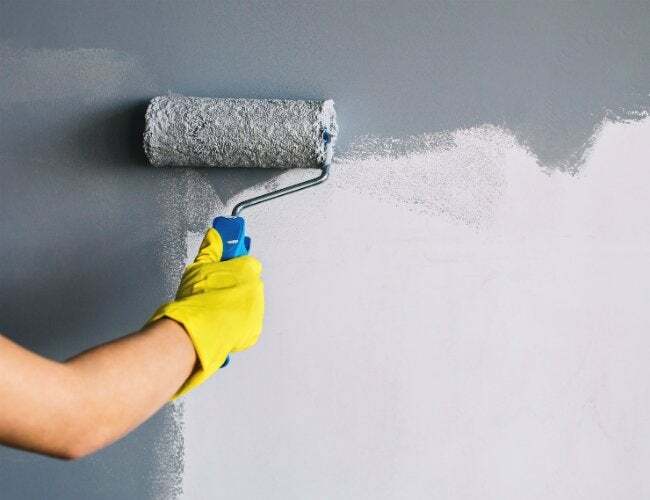 Consider primer a priority, however, if you’re dramatically changing the wall color (for example, from dark to light) or painting over high-gloss paint, new drywall, or a repaired wall. Using the sharp tip of the HYDE 17-in-1 Painter’s Tool blade, pop open the primer and tip some into a paint tray. First, use an angled paintbrush to carefully paint around the edges of the wall. If you’re dealing with just the odd patch or stain on the wall, you can opt to spot-prime—or cover only the offending areas in primer—to conserve your supply and save time. Otherwise, load your roller with primer to apply a single coat to the wall. Let the primer dry according to the manufacturer’s recommendations before moving on. STEP 3: Layer on paint. A professional-quality DIY paint job begins with “cutting in,” or painting the edges of the wall to protect abutting surfaces such as ceilings and trimwork from errant paint strokes. Enlist a two- to four-inch-wide angled brush to paint a band that extends three inches in from the edges of the wall. 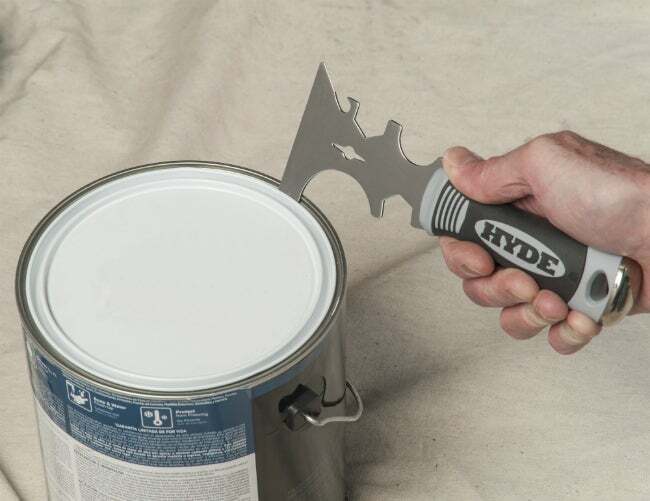 Here again, with the HYDE 17-in-1 Painter’s Tool in your pocket, opening a can of paint is as simple as jimmying off the lid with the sharp tip of the tool. Opt for either a latex- or water-based paint in your choice of sheen (flat, satin, eggshell, semi-gloss, or high-gloss); avoid applying an oil-based paint directly over a latex-based primer. Pour some paint into a paint tray, then load the roller with paint. Starting near a bottom corner of the wall, push the roller upward for a full, comfortable stroke. Then, tilt your hand so that you pull the roller back down the wall without losing contact or compromising your even coverage. Repeat this process until the wall is coated in color, using a ladder to reach the highest points. Then, without reloading the roller, gently back roll over the entire wall to catch uncovered or dimpled areas while the paint is still fresh. Let the coat dry completely according to the paint manufacturer’s instructions. If desired, apply a second coat to achieve more uniform coverage and allow it the same amount of time to dry. Do you prefer to use a spray gun instead of a roller? Use the two built-in wrenches (the four-sided notches) of the Painter’s Tool to connect a whip hose to your spray gun in a jiffy for a fatigue-free spray job. STEP 4: Clean up shop. Your newly painted wall isn’t ready for its big reveal until you tidy up the work space. Remove the painter’s tape from the wall, discard used drop cloths, seal paint cans (just tap the lids on with the hammerhead end of your multi-tool), and wash your paintbrush and tray. 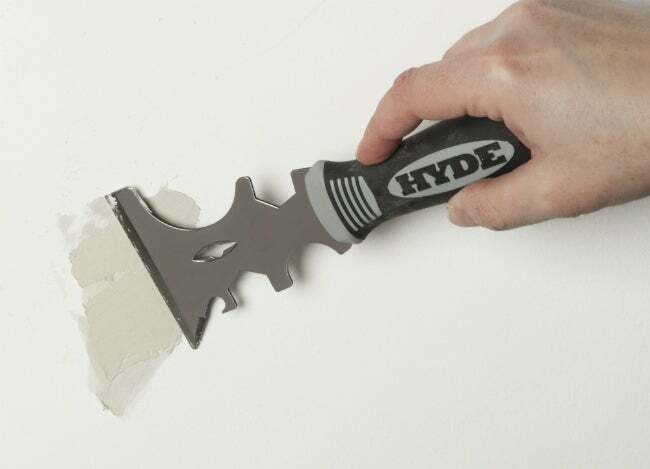 As for that extra-absorbent roller cover, the quickest way to get it squeaky clean is to first squeeze out the excess paint over a paint can: Just hold the cover in one hand and use the other to run the large oblong groove of the HYDE 17-in-1 Painter’s Tool along its edge. 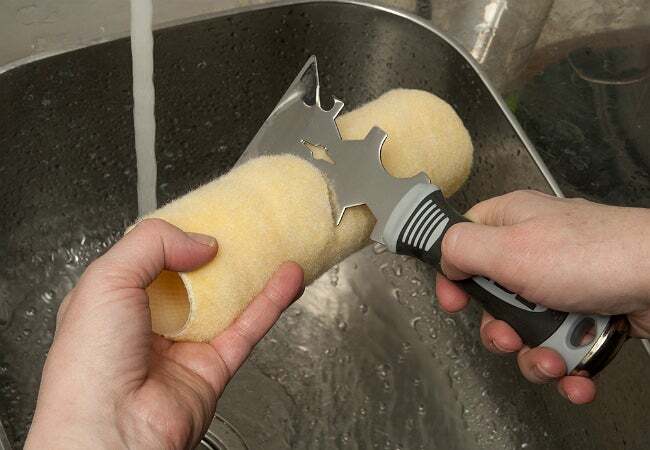 Then, go ahead and toss it into the sink to wash it with everything else! Last but not least, put the finishing touches on your wall by replacing the furnishings and reinstalling removed wall decor. Open up the multi-tool’s handle for access to whichever screw bits you need to reattach shelving, switch plates, and outlet covers. Then, cap the hammerhead end once more so you can drive in nails lightning fast as you rehang all your artwork. Finally, sit yourself down in a comfy chair and admire your completely refreshed room.